Back in 1829, the first ever bus journey took place on 4 July, travelling from Paddington to Bank in London. Today, more than five billion bus journeys are made every year in the UK, at least 20% of which are made by commuters, who rely on the bus network to get to work. Buses remain the nation’s most widely used form of public transport, providing crucial travel access for millions of people. Yet despite their extensive economic, societal and environmental benefits, however, buses are often overlooked and undervalued. Set up in 2013 by the transport campaign group, Greener Journeys, the annual Catch the Bus Week campaign is a high-profile opportunity to celebrate and demonstrate the transformative benefits of the bus, as an accessible and inexpensive solution to problems such as air pollution and urban congestion. Through this campaign, Greener Journeys, a coalition of the UK’s leading public transport organisations, user groups and supporters, wants to facilitate behaviour change to make the bus the go-to transport option. 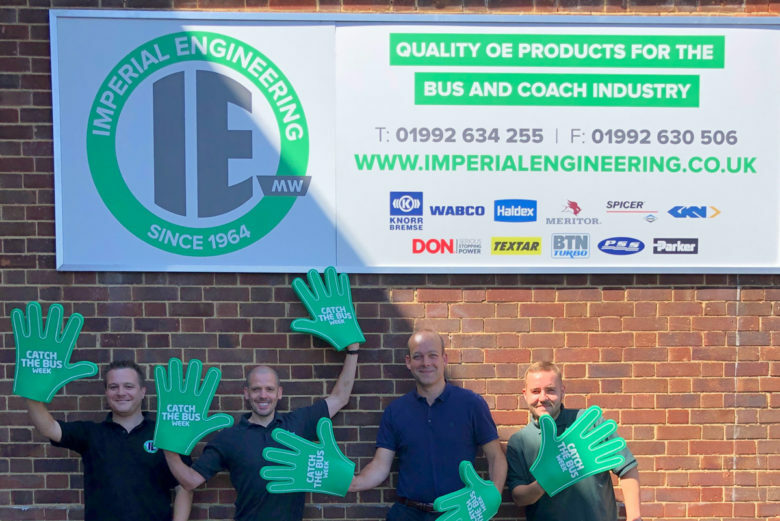 Separately, one of bus parts specialist Imperial’s major customers, Arriva, has announced that almost all its UK bus and rail sites will be powered by 100% renewable electricity, after entering a three-year electricity supply contract with SSE Business Energy. The new contract will enable Arriva to report zero carbon-emission electricity, preventing an estimated 27,000 tonnes of CO2 from entering the atmosphere each year. This makes Arriva the first major private transport operator in the UK to switch to a 100% renewable electricity supply, and marks a major milestone in its journey towards ‘Destination Green’, which is a Europe-wide environmental sustainability programme.